Just about one year ago, exactly, my dad set out to make his own bread. 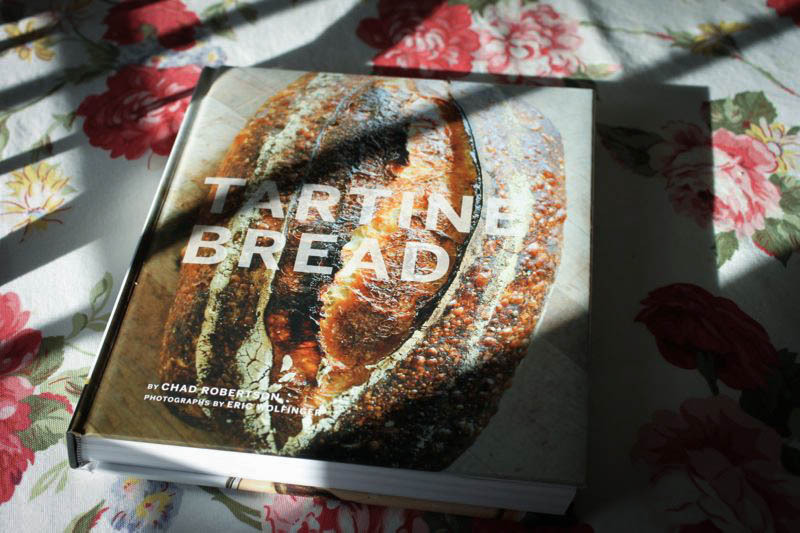 He mentioned wanting to find a great recipe to get the ball rolling, and I suggested the Tartine Bread cookbook. I’d never made the Tartine bread, or anything from any Tartine cookbook at that point, but I knew their bread was my favorite and the cookbook was beautiful. After a few trials, dialing in the basics to make it works for his set up, my dad figured it out. He’s become quite the bread wizard, experimenting with different variations all the time. 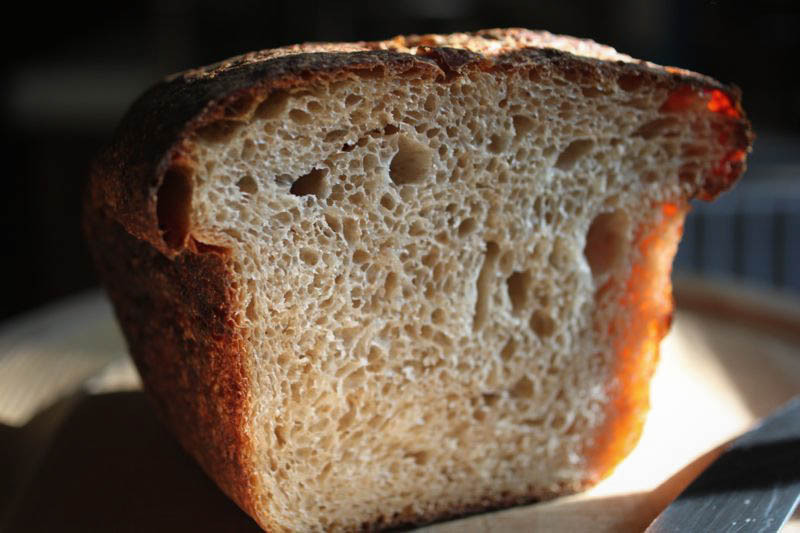 The loaf he uses for his everyday bread is amazing – I’ve enjoyed many a sandwich with that bread. Spending a few days at my parents’ this past weekend, it began calling out to be made into French toast. The last section of the cookbook is full of recipes for day-old bread. How clever and practical! I used their French toast recipe to make the fanciest breakfast delight for my family. In a bowl, whisk together all ingredients for the custard base. Place the slices of bread in the bowl for about 1 hour, until the bread is saturated. Heat a skillet over med-high heat, and melt the butter to coat the pan. Place each slice of bread into the skillet, cooking for approximately 3 minutes, pressing on them occasionally with the bottom of the spatula to help seal the bread and it cooks evenly. Ladle more custard base into the center of each bread slice. If the liquid leaks out of the bottom, the bread isn’t sealed, so continue cooking for 1 minute, pressing again slightly to help the custard seal. When they are sealed, transfer the skillet to the middle rack of the oven without turning the toast! Bake the slices 12-15 minutes, and then shake the pan to see if the custard is still liquid. If so, continue baking. The thickness of the slices impact the bake time, so they may need to bake for up to 20 minutes. The custard soufflés when fully cooked, so look for inflated slices when they’re done! I want to share this cookbook with one of you! To enter the giveaway, please leave a comment letting me know your favorite way to eat bread! All comments need to be left here on this post by midnight Thursday August 17, 2012. I’ll be announcing the lucky winner on Friday morning! My favorite way to eat bread? Out of the oven, warm, with unsalted butter and a sprinkle of sea salt. My favorite way to eat bread is warm or slightly toasted & coated with jam. Learning to soak the bread in the custard mixture completely revolutionized my French Toast making. It’s so much better! Lightly toasted and buttered with drops of honey. My favorite way to eat bread? BLT, yum. Bread pudding, yum. Bruschetta, yum. Something I really love is Welsh rarebit. Sounds fancy and exotic, British isles style, right? Actually it’s just toast with cheese sauce, nom, nom, nom. Since I’m in Turkey, I love to have the typical Turkish bread warm out of the oven – crispy on the outside and soft and warm on the inside – with some real butter smothered all over it! peanut butter and homemade jam – that’s how we do. Oh! My favorite is toasted with butter and honey. Does “ALL THE TIME” count? Definitely bread pudding! My favorite and most indulgent use up for stale bread. 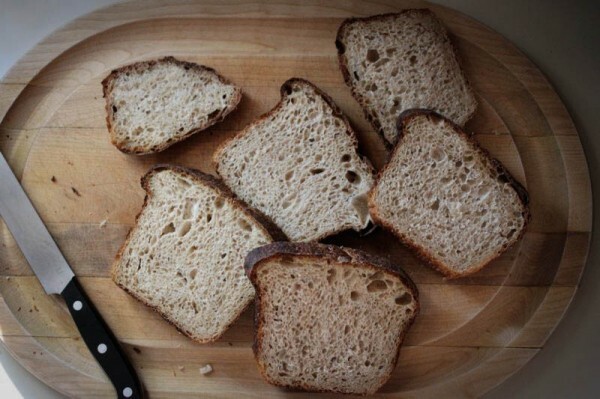 I love bread in general… but you can’t beat a fresh slice, still warm from the oven with a little butter on top. YUM. MY favorite way to eat bread is lightly toasted with butter. Torn off a hot fresh loaf and dipped in seasoned olive oil. My favorite way to eat bread is toasted with butter & honey. What a great giveaway! I love to eat bread fresh out of the oven with honey and butter. mmmmmmmmm so delicious! Your Tartine Bread French Toast is fantastic!! My favorite way to eat bread? With ham and mozzarella! Fresh bread is one of the best things in the world. I love getting a piping hot baguette from the bakery to eat little bits of it all the way home…or simply any bread toasted with nutella! My fav is french toast, but nothing like yours. I’m drooling. Toasted with butter. Or with thick slices of tomato and mozzarella during summer. Never has to be anything fancy, but a “to die for” sandwich is the Monte Cristo with raspberry preserves to dip it in…oh my! My favorite way would be a lightly toasted piece of freshly baked bread with a bit of honey apple butter smeared across the surface. So tasty. Oh–with smashed avocado, a bit of Tapatio, and a sprinkle of sea salt! I’m pretty content with the simple things in life. Just toast it and spread generously with butter and I’ll be happy as a clam. Occasionally, I’ll add some raspberry jam for variety. I love toast and would say my favorite way to eat it is with a perfectly poached egg! Strong runner up would be warm from the toaster with Butter & Jam. I love the simplicity of bread and butter. I like the bread cooled just enough so that the butter keeps its form slightly (versus melting completely, leaving me wondering if there is butter at all anymore while my hands are actually all greased up! ), and even with a tiny smidge of sea salt atop! The smitten kitchen recipe for spring panzanella is an amazing use for bread. i can’t stop eating the buttery, garlic-y, parmesan-y cubes before the whole dish is assembled. Also, toasted with avocado, salt and pepper. I love just barely cooled bread dipped in some olive oil that’s been flavored with a touch of sea salt. Simple and perfect. I’m joining the toasted, with butter crowd. Another good option is toasted with Nutella. I’m in the UK and this time every year my mum goes to a tree at the side of a quiet road next to a cornfield to pick bullace – a small wild hedgeplum. They make a pinky caramel-coloured jam: sharper than cherry plum, more complex than victoria. The best thing ever is this jam, spread on melty salted butter, on a thick slice of toasted crusty bread. It rights all wrongs. In a panzanella or savory bread pudding! Toasted, cooled, spread with copious amounts of butter and just a little Marmite(that my American husband absolutely hated but now loves!). Comforts me of every shred of disappointment or homesickness and makes any victory sweeter! I’m simple and how I like my bread depends on what I feel like each morning. Right now I love peanut butter on toast and sometimes I load it up with banana and honey! My favorite way to eat bread is sliced fresh off a new loaf, toasted lightly, buttered with salted butter and slathered with freshly made jam. I love anything with blueberries… this includes french toast and not too much butter … the less butter the better. SHOCKING, I know. okay, okay- i’ll enter to win the bread book. i definitely need to learn a thing or two. and my favorite way to eat bread would be with peanut butter and jam. You have 49 responses! Go you Emily! I personally been obsessed with French Toast and just simple toast with butter. No real creative juices on my response! I passed Tartine again and thought of you! 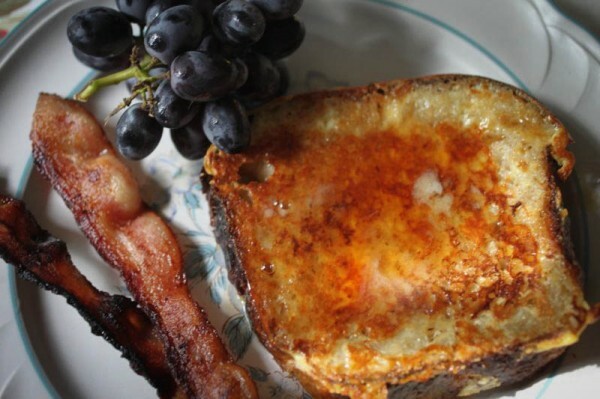 So many yummy comments-love the french toast recipe! My favorite way to enjoy: Crusty French Bread, warm out of the oven, slathered with butter, then with a spoonful or two of husband Ike’s garlic-heavy basil tomato sauce, then with good parmesan or romano, and perhaps a sprinkle of olive oil. So basic but so good. With my son… with much the same description. Toasted with some orange marmalade. Hmmm… One of my favorite ways to eat day old bread is in ribolita (bread soup). For fresh bread I like it toasted and topped with olive oil, fresh sliced tomatoes, basil, and salt. Yum! Ever take one of those vacations that you thought would be so relaxing? But instead, you ended up being forced into a macrobiotic diet that left you incredibly hungry all the time? And you were offered coffee by your hosts, while being told (by them), “It smells good, but I wouldn’t put it in my body”? Or you were awakened way, way too early to go on a “walk” that ended up being a hike up a MOUNTAIN? On no coffee? And once you realized that this was going to be awful but you can get through, you’ll just zone out on TV, there was no TV? And then you were going to see the beautiful scenery in the area – “a little tour”, they called it – and you wound up looking at bronze plaques listing the names of sailors who were lost at sea? A whole lot of bronze plaques? Ever take one of those trips? I did. It was terrible. But I did learn that I absolutely LOVE toast with tahini, honey and salt. Tahini: because peanut butter is, and I quote, “toxic”. White soft sheep cheese (or feta cheese) and fresh soft sourdough bread on the side. 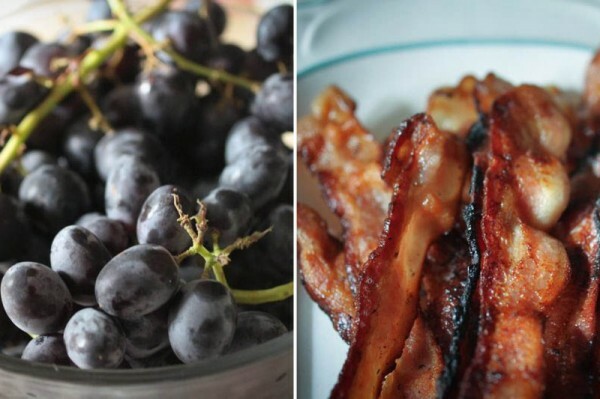 I know it sounds weird, but it’s such a tasty combination. Warm from the oven, if I’m lucky, with homemade strawberry jam! I love sourdough bread toasted and topped with olive oil spread and hot sauce. The sour in the bread and the vinegar in the hot sauce are the best!!! A new French bakery opened in town last month so I’ve been buying fresh baguettes every once in a while, and eating warmed slices with butter and cheese I bought in Paris. Nothing special or fancy but my absolute favorite way to eat bread.